Progressive supranuclear palsy (PSP) or Steele- Richardson-Olszewski syndrome is a neurodegenerative disease of unknown cause affecting individuals in middle and late age. Its prevalence is 1.39 per 1,00,000 in United States. Features of PSP resemble Parkinsons disease and the two diseases are often confused. Clinically, the disease is characterized by early postural instability with recurrent falls, vertical gaze palsy, pseudobulbar palsy with speech and swallowing problems, bradykinesia, axial rigidity, and subcortical dementia. The gait is clumsy, slow, and unsteady, resembling a “drunken sailor”. The disease was named progressive supranuclear palsy, referring to the progressive degeneration of the brain structures localized superior to the oculomotor nuclei, causing palsy and eventual paralysis of ocular movements. Pathologically, the disease is characterized by neurodegeneration, gliosis, and abnormal accumulation of tau protein in the basal ganglia, brain stem, prefrontal cortex, and cerebellum. In PSP, the tau protein becomes resistant to proteolysis and is partially crystallized, forming abnormal deposits of tangled fibers, which are called neurofibrillary tangles. Till date, there is neither effective medication nor surgical treatment to cure or delay the progression of the symptoms in PSP. Although palliative interventions may be used to alleviate major symptoms, no drug has been found to efficiently treat the origin of the problem. Āyurvedic treatment has been found effective in neurodegenerative disorders like progressive cerebellar ataxia and Parkinson's disease., In the present study, the patient of PSP was treated with Pañcakarma treatment along with rejuvenation therapy to minimize the effects of neurodegeneration. A 55-year old lady already diagnosed with PSP presented at the Department of Pañcakarma in March 2012, with the chief complaints of inability to walk, falling over backward, memory loss (Smṛtikṣaya) and increased episodes of spontaneous laughing. Patient started complaining of memory loss since 2001 with minor incidents like: forgetting her keys, forgetting to mix salt in food etc., The memory loss gradually increased and by September 2010, she was not able to remember her signature. She also had complaints of falls along with balance and gait difficulties (Gati saṅga) since 2003. The problem persisted and the patient was referred to a neurologist where diagnosis of PSP was established. Past medical history included hypothyroidism and hypertension. Family history was not significant. On observation, face was expressionless and mask-like. Patient had poor balance with the tendency to fall over backwards. On sitting, trunk deviation was seen towards right. She was able to walk only with support and gait was slow and wide based. Dysarthria (Vāk graha) was present but most of the words were comprehensible. Horizontal saccades were slow but vertical saccades were more affected. Downward gaze was hampered severely [Figure 1]. Neck rigidity was observed during extension. She used to fall abruptly on the chair while sitting down and was unable to get up from the chair without support. 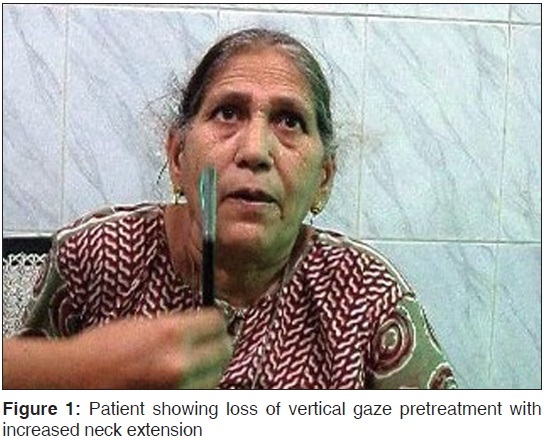 Postural stability was severely impaired with patient requiring assistance to stand still. Average sleep was less than 5 hours per day and patient complained of difficulty both in falling asleep and remaining asleep (Nidrā nāśa). 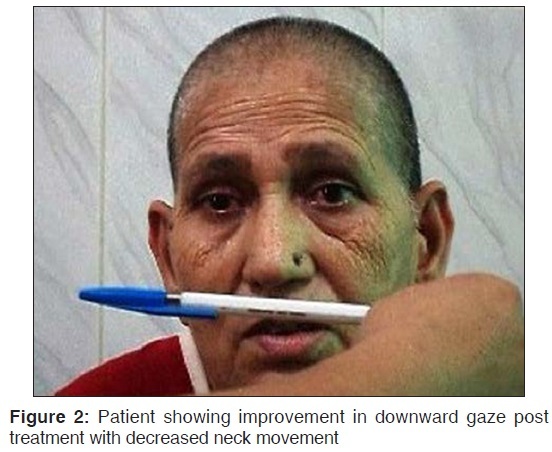 Ocular examination revealed loss of upward and downward gaze. Blinking was severely affected with blink rate of less than one per minute. Patient was able to read, however the vision was blurred. Patient was assessed for cognitive impairment using Mini Mental Status Examination (MMSE) which showed mild deterioration of cognitive functions. Her ability to write was severely affected. Magnetic Resonance Imaging (MRI) revealed midbrain, frontal and cerebellar atrophy. For assessing disability, progressive supranuclear palsy rating scale (PSPRS) was used. It comprises of 28 items in six categories: daily activities (by history), behaviour, bulbar, ocular motor, limb motor and gait/midline. Scores range from 0 to 100. Inter-rater reliability is good, with intra-class correlation coefficient for the overall scale of 0.86 (95% CI 0.65-0.98). 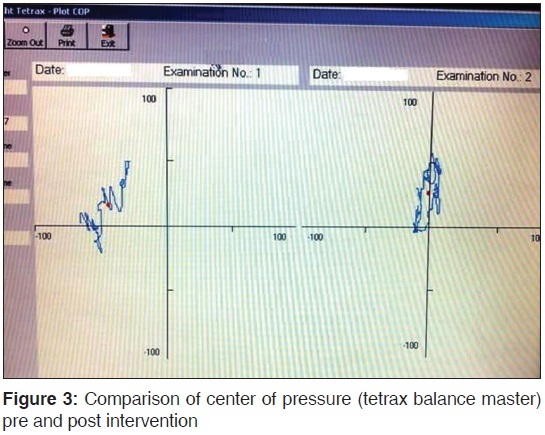 Balance was assessed by using Tetrax Interactive Balance System (IBS) posturography. It measures the anteroposterior and mediolateral sway of the patient under eight conditions (facing forwards eyes open, eyes closed; standing on foam with eyes open, eyes closed, stable standing eyes closed head rotated to right, left, back and forwards). After taking informed consent of the patient the treatment was started with Virecana karma (purgation). The classical process of Virecana was completed in 15 days. The allopathic treatment being taken by her then was stopped on the day of purgation and was restarted afterwards. From 16th day onwards, Mātrā basti, Śirobasti, and palliative treatment were started. Mātrā basti was given on alternate days for consecutive 3 months, while Śirobasti was given in two courses of three sittings each. Each session of Śirobasti comprises of 7 days. Between two sessions of Śirobasti, a compulsory break of seven days was given [Table 1]. 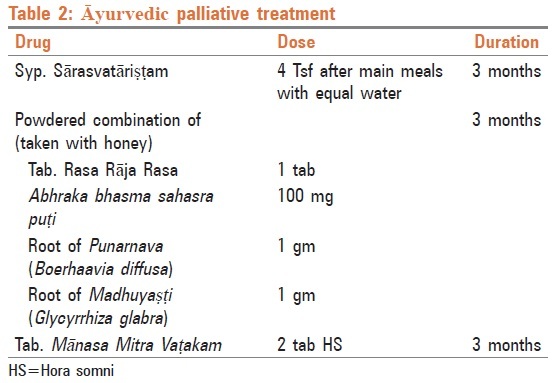 The palliative treatment was started in accordance with the treatment for Vāta vyādhi as described in classics and rejuvenation therapy, [Table 2]. 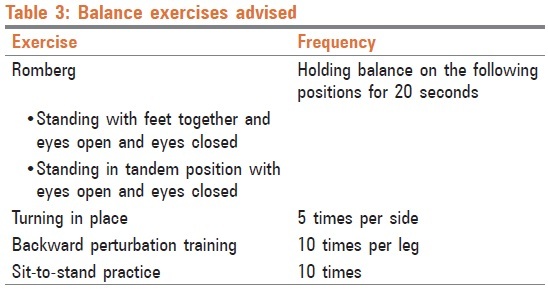 Additional balance exercises were given to the patients under the supervision of physiotherapists [Table 3]. On comparison with pre-intervention conditions of the patient, there was a significant improvement in the patient post-treatment. The features which mainly showed improvement were: eye movements, spontaneous episodes of laughing, dysphagia, dysarthria, sleep difficulty, double vision, and neck rigidity [Figure 2]. Falling over backwards had reduced considerably and on observation, face was more relaxed. There was a marked improvement in the patient's problem of her tendency to fall backwards. Scores on PSPRS showed significant improvement. The patient scores in daily activities area reduced from 12 out of 24 to nine. In the mentation area scores reduced from six to three out of 16 points. Out of eight for the bulbar area, scores reduced from four to two. However, in the limb motor area which had a score of 16, there were no changes found. Scores in the ocular motor area improved from nine to four out of 16 and for the gait area scores reduced to 12 from 16 out of 20 points. 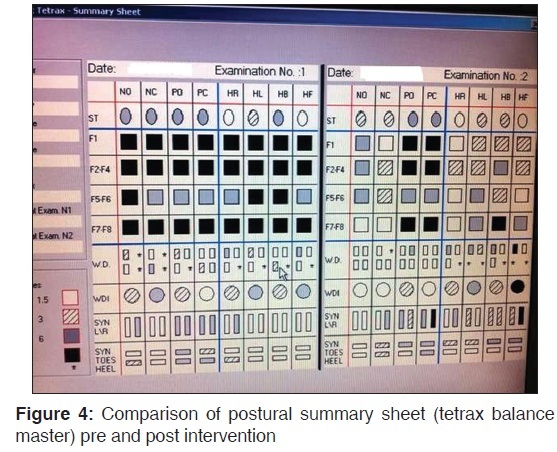 Pre-intervention, patient showed an increased sway with poor results in the postural summary sheet in all the eight positions was along with an unequal weight distribution. Fall index of the patient showed high risk of falling. Post-intervention, postural sway had markedly decreased [Figure 3]. Fall index reduced considerably [Figure 4]. Explanation of the exact mode of action of any treatment on modern parameters is difficult, however based on Āyurvedic classics, a hypothetical mode of action has been proposed below. Vāyu is considered to be the cause of all type of movements of the body and plays a major role in the pathogenesis of various diseases. It aggravates due to Dhātuksaya (tissue diminution) or by Āvarana (occlusion of its channel by other tissues). Most of the neurodegenerative disorders present a picture of Vāyu dominant symptoms where Vāyu primarily gets aggravated due to Āvarana (occlusion), which in turn leads to Dhātuksaya (tissue diminution) leading to increased aggravation of Vāyu. This feedback mechanism make neurodegenerative diseases almost incurable, if treated late. In the pathological process of PSP, aggregation of tau protein in the brain tissues can be correlated with one type of Āvarana leading to Dhātuksaya in the form of gliosis and neurodegeneration. In the present case, the initial pathology involved can be interpreted as Kaphāvrta Udāna Vāyu and Kaphāvrta Vyāna Vāyu, which finally leads to Dhātuksaya. At the time of presentation, patient's age, disease progression and MRI findings suggestive of atrophy in different parts of brain were indicative of pathology of Vāyu. Hence, treatment was started in accordance to the line of treatment for Āvarana (occlusion). In the first step, mild Virecana was given as it is the choice of treatment for aggravated Vāyu. It causes downward movement of Vāyu and hence helps to overcome the Āvarana., In a degenerative disorder to replenish the tissue elements, oleation therapy and rejuvenation therapy is required and hence in the second step of treatment Mātrā Basti, Śirobasti, and palliative treatment were administered with an aim to minimize the effects of gliosis and neurodegeneration. Virecana is one method of Śodhana, a type of Pañcakarma (bio purification) treatment of Āyurveda. It helps enhance metabolism, restore normal health and clarity of sense faculties, mind, intelligence, and complexion. Śirobasti is indicated in chronic Śirorogas (neuro degenerative disorders). In the process of Śirobasti, oil is filled over the head for a certain time using special leather cap that is fixed with the dough of black gram. Mātrā basti is one type of Basti treatment which can be administered safely in all seasons. It is Balya (promotes the body strength), Brhmana (provides nourishment to the depleting tissues), and Vātaroganut (curative of diseases caused by Vāyu). For ethical reasons, Amantadine and other prescribed treatment was not stopped except at the time of Virecana karma. Apart from side effects like confusion, hallucinations, and orthostatic hypotension, role of Amantadine in PSP is very limited and restricts only to dystonia and Parkinson like symptoms. Any role of Amantadine in vertical gaze, spontaneous episodes of laughing, dysphagia, and double vision has not been documented. After Āyurvedic treatment, even these symptoms improved significantly. Āyurvedic treatment along with Pañcakarma and balance exercises has shown definite result in reducing disability and improving balance in this patient with PSP. In the light of encouraging results obtained so far in this patient, the treatment can be administered in more patients of PSP to document the definite outcome. Here, an effort was made to treat PSP using Āyurvedic concepts but because the patient was already diagnosed using tools of bio-medicine, bias cannot be completely eliminated. We acknowledge the support of Shilpi, Pahun, Ravindra, and Sonia, Interns in the Department of Pañcakarma, Ayurvedic and Unani Tibbia College and Hospital for conducting Pañcakarma procedures. 1. Rehman HU. Progressive supranuclear palsy. Postgrad Med J 2000;76:333-6. 2. Burn DJ, Lees AJ. Progressive supranuclear palsy: Where are we now? Lancet Neurol 2002;1:359-69. 3. Sriranjini SJ, Pal PK, Devidas KV, Ganpathy S. Improvement of balance in progressive degenerative cerebellar ataxias after Ayurvedic therapy: A preliminary report. Neurol India 2009;57:166-71. 4. Nagashayana N, Sankarankutty P, Nampoothiri MR, Mohan PK, Mohanakumar KP. Association of L-DOPA with recovery following Ayurveda medication in Parkinson's disease. J Neurol Sci 2000;176:124-7. 5. Sharma RK, Dash B, Translator. (Reprint edition). Agnivesha's Charak Samhita. Vol. 2, Nidaan Sthana; Unmaasnidaan. Chapter 7, Verse 4. Varanasi: Chaukhamaba Sanskrit Series Office; 2007. p. 88. 6. Sharma RK, Dash B, Translator. (Reprint edition). Agnivesha's Charak Samhit., vol. 2., Vimaan Sthana; Srotovimaniya. Chapter 5, Verse 10. Varanasi: Chaukhamaba Sanskrit Series Office; 2007. p. 177. 7. Golbe LI, Strickland PA. A clinical rating scale for progressive supranuclear palsy rating scale in progressive supranuclear palsy. Brain 2007;130:1552-65. 8. Vaidya L. Bhaishajyaratnawali of Govind Das; Vaatvyadhiadhikaar, Verse 470-6. 8th ed. New Delhi: Motilal Banarsidas; 2007. p. 356. 10. Zampieri C, Di Fabio RP. Balance and eye movement training to improve gait in people with progressive supranuclear palsy: Quasi-randomized clinical trial. Phys Ther 2008;88:1460-73. 11. Sharma RK, Dash B, Translator. (Reprint edition). Agnivesha's Charak Samhita. vol. 1., Sutra Sthana; Vaatkalakaliya. Chapter 12, Verse 8.Varanasi: Chaukhamaba Sanskrit Series Office; 2007. p. 237. 12. Sharma RK, Dash B, Translator. (Reprint edition). Agnivesha's Charak Samhita. vol. 5., Chikitsa Sthana; Vaatvyadhi. Chapter 28, Verse 59. Varanasi: Chaukhamaba Sanskrit Series Office; 2005. p. 36. 13. Tripathi B. (Reprint edition). Astanga Hrdayam of Vagbhata, Nidaan Sthana; Vaatshonita. Chapter 16, Verse 47-8. New Delhi: Chowkhambha Sanskrit Pratisthan; 2009. p. 550. 14. Tripathi B. (Reprint edition). Astanga Hrdayam of Vagbhata, Sutra Sthana; Doshopkrmaniya. Chapter 13, Verse 1. New Delhi: Chowkhambha Sanskrit Pratisthan; 2009. p. 185. 15. Sharma RK, Dash B, Translator. (Reprint edition). Agnivesha's Charak Samhita. vol. 5., Chikitsa Sthana; Vaatvyadhi. Chapter 28, Verse 239-42.Varanasi: Chaukhamaba Sanskrit Series Office; 2005. p. 84. 16. Sharma RK, Dash B, Translator. (Reprint edition). Agnivesha's Charak Samhita, vol. 1., Sutra Sthana; Chikitsprabratiya. Chapter 16, Verse 17-9. Varanasi: Chaukhamaba Sanskrit Series Office; 2007. p. 303. 17. Tripathi B. (Reprint edition). Astanga Hrdayam of Vagbhata, Sutra Sthana; Gandushaadividhi. Chapter 22, Verse 26. New Delhi: Chowkhambha Sanskrit Pratisthan; 2009. p. 260. 18. Sharma RK, Dash B, Translator. Agnivesha's Charak Samhita, vol. 6., 2nd ed. Siddhi Sthana; Snehavyapat. Chapter 4, Verse 52-4.Varanasi: Chaukhamaba Sanskrit Series Office; 2005. p. 247. 19. Kompoliti K, Goetz CG, Litvan I, Jellinger K, Verny M. Pharmacological therapy in progressivesupranuclear palsy. Arch Neurol 1998;55:1099-102.